This lab program is designed to push writers to go through the entire creative process (from idea, to rewrite, to final piece) with the pressure of deadline. Writers in the Specialized Lab write one full 10-15 page short-story each month as they prepare their novel ideas. Creative writing program at fadein (Seminar and workshop) or Screenwriting program at fadein (Seminar and workshop). Invitation by creative writing coach at fadein. 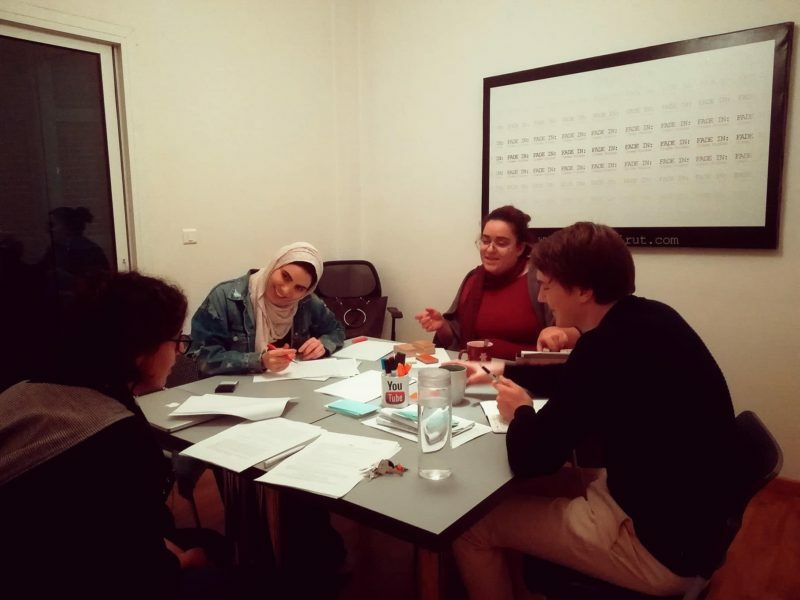 Nadia Tabbara‘s lab meets 2x per month on Tuesday evenings. Youmna Bou Hadir‘s lab meets 2x per month on Saturday mornings. Each week, deadlines are set for writers that they must meet. With few exceptions, writers inside the lab who do not meet deadlines can no longer continue. We are a group of serious writers and we continue to create new stories and finish our work. The pilot of this lab began in January 2018 and so far, writers have been consistently finishing one short story per month and building their portfolios.